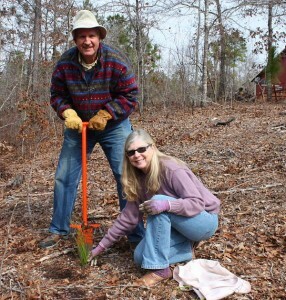 Every year we plant about 300 longleaf pines. It’s relatively inexpensive, it’s fun, and we think it’s one of the best ways we can prepare our farm for the coming climate chaos. We love longleaf pines for several reasons. They are the native tree for our region, they are very resistant to fire (impress your friends with the word “pyrophytic”), they have a huge and tenacious taproot that holds hilly soil, and they contribute to biodiversity by admitting light to the forest floor. In today’s program we describe these and other reasons we love longleaf pines so much – hey, we named the farm after them! – and we talk about our hands-on, low-tech method for planting them together. We have a system for planting longleafs. Amanda picks a spot and I pound that orange dibble into it to create a vertical hole. She sticks in a longleaf seedling. While I’m packing the dirt around the seedling, she’s off picking the next spot. This makes the most of our gifts, Lee’s brute strength and Amanda’s taste and intelligence. What could be more efficient? 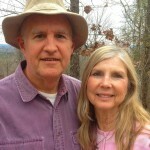 Next Next post: Podcast #224 – If You’re Serious About Longleaf Pines . . .